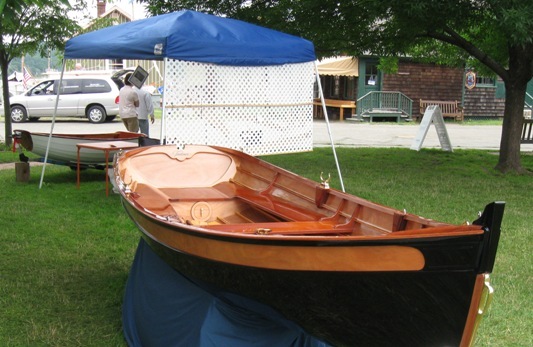 Marionette's tender, 'TEER was exhibited at the 2009 Wooden Boat Show on June 26-28 in Mystic Seaport, Mystic, Connecticut. This annual show is organized by Wooden Boat Magazine. 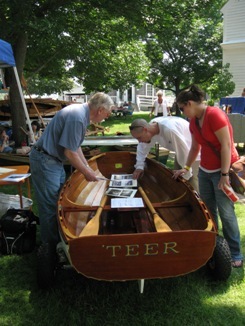 TEER was part of the IBIM "(I Built It Myself") section featuring over 50 wooden boats of all types. This photo is of TEER's exhibit, taken early in the morning before the show opened. The display board had designer Ian Oughtred's "Feather Pram" plans, and sample pieces of various parts and 'tools', the "C" clamps and wedge (not visible), a strake, and the upper part of a mold station. 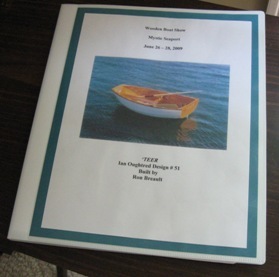 The idea was to show people that you really could build such a boat, and here was the proof. You can read the full story of how TEER was built by clicking here. Dolphin 24 work continued as at least 2 new DFI's (Dolphin Field Investigators) were recruited. Naturally, people visiting TEER'S booth asked about what kind of boat she tendered. And naturally, among the various photos displayed, were a few of Marionette which your webmaster was happy to discuss. The first of these visiting DFIs regularly cruises Narragansett Bay in Rhode Island, and frequently goes into Wickford. He will investigate a mysterious Dolphin reported moored in the Mill Creek anchorage in Wickford. Note: July 2, 2009 DFI Nicole reported that a close visual inspection revealed this was not a Dolphin. 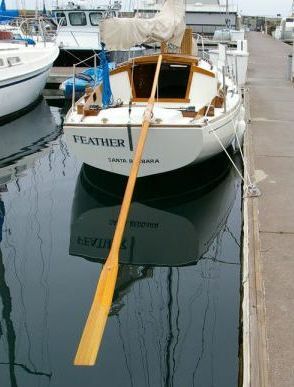 The other DFI, a retired Navy guy was looking for a small dinghy and was interested in "TEER. He reported that he had seen a Dolphin several years ago in the same Honolulu marina where he keeps his boat. He recalls that the owner's name was Zane Grey - no kidding, but not THE Zane Grey, also that this boat had no engine - and that she had a large sculling oar. A manual was prepared for this exhibit which simply was the "TEER" story downloaded and printed from the Stories section on the Dolphin 24 website. Some of the pictures were blown up to 8.5 x 11 size, and laminated. Exhibiting one's work at a show like this can be very humbling. 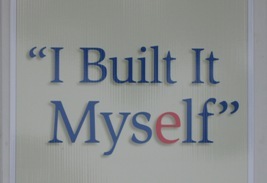 Besides the new boats that are being exhibited, the "I Built It Myself" group has some incredible craftsmen and perfectionists. One that stood out, and who won the top prize in the Concours d' Elegance competition, was Fred Rettig from southern Alabama. 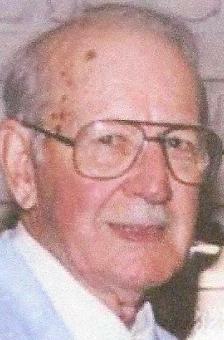 His Tenderness, a Penobscot 14, got the top prize among rowing boats. 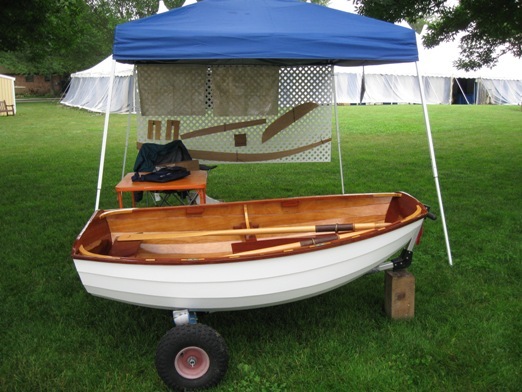 This boat was loaded with inlaid hard wood detail, and custom fittings, oarlocks, cleats, etc., machined from solid brass. The varnished and painted surfaces were so perfect that words fail description. Nearly 1200 hours went into building her. Getting this picture was difficult as Tenderness was almost always surrounded by admirers. TEER'S exhibit is in the background. Dedicated Dolphin 24 history buffs will immediately identify with the name on the transom of this Beetle Cat on display at the Seaport. Palmer Scott at Marscot Plastics in Fall River, Massachustetts, laid up the Dolphin glass laminates - 2 half hulls, a deck, cabin and cockpit - and trucked these parts across the Acushnet River to the old Beetle yard in New Bedford. 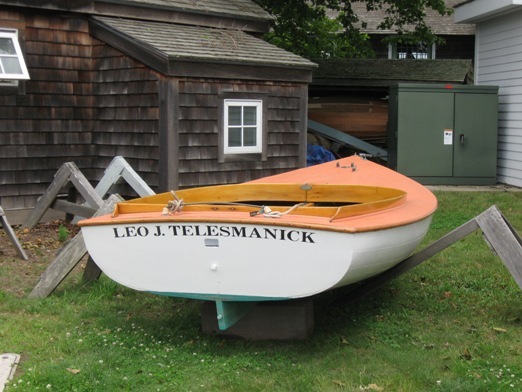 There, his foreman, Leo Telesmanick and his group, bonded the parts together, added the toe rails, combings, and hatches, built out the interiors, installed the Palmer inboard, finished the boat, and, for those early buyers like Stan Secora, JATO, hull #7, put in the rig and commissioned the boat for launching and customer pick up. 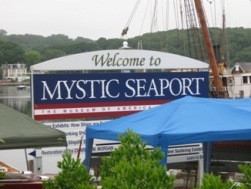 Leo was a consultant to Mystic Seaport Museum and is considered one of the legendary New England boat craftsmen. The above boat was built by Beetle Cat and donated to Mystic Seaport in his honor. . More about Leo can read by clicking here. 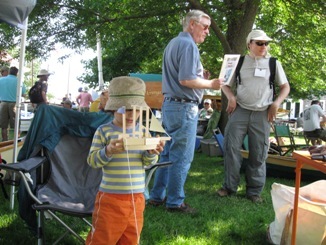 Special thanks to expert boat designer and builder, grandson Griffin, then 4, and an experienced 'TEER crew. Also to son Michael, fellow Dolphin owner (Passage, #10) and expert Marionette crew, for their technical assistance provided at the show. December 5, 2009. A reader advised us the other day that 'TEER made it to the Wooden Boat Magazine Online "Launchings" site. Here is the link. This despite the fact that she was launched in the last century!